and carefully setting off through some lights which have just gone green. And cue video of a cyclist going through a red light (note the cyclist in the distance obeying the red light). “The number of cyclists in London has trebled in the last ten years” says the voiceover. Sounds impressive. 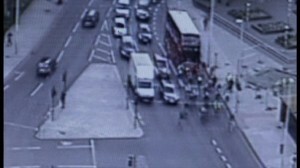 “Watching over this tribe on London’s roads is a specialist cycle task force.” Cyclists are a tribe are they? “Today PCs Tony Austen and John Harrison are targeting Elephant and Castle roundabout in South London. A notorious spot for red light jumpers.” Elephant and Castle is also a notorious spot for cyclist incidents, but the narrator forgets to mention that or that, as TfL’s own twitter feed noted, it is set for overhaul (after much delay). They don’t blame the bus congestion on the cyclists either, as it happens. So TfL and the roads task force are concerned about the safety of this junction and to help that safety our “cycle task force” are talking to cyclists and fining them. How does this help, exactly? PC Harrison: “Once one person does it at the front of the pack, others will be tempted to do it. You can punish people, and hopefully change their behaviour.” Hmm, this is over a couple of cyclists jumping whilst a good crowd don’t jump. Not a word about safety or the view expressed by TfL and others that Elephant and Castle is unsafe and unpleasant. PC Harrison, jumps into the road and says “STOP!” at a cyclist. “What happened there?” Mr Bike: “I just find it easier to go through the lights than…” PC: “well, it may be easier but the lights are there for a reason” Hang on, he was trying to say something. What was it? And off he goes to rejoin London’s traffic. So, have the police listened or do they have their own particular view of what’s going on? PC Harrison: “They’re on a mission, they’re on their way to work, they’re trying to beat their personal best time of getting to work and traffic lights are an inconvenience, and they’re the people we need to target.” Right, whereas that nice big lorry sharing the roads with them behind you has NOTHING to do with the problem, right? And off to the cycling superhighway! PC Austen: “you versus a car or a van who do you reckon will win?” he says to a woman he’s pulled over. Ah, so safety is an argument then. Narrator: “With a cycling revolution happening on the capital’s streets, Transport for London’s traffic controllers must now also contend with this new breed of user.” People have been cycling on London’s roads longer than Transport for London has existed. Who writes this drivel? Now, Critical Mass – almost 20 years old in London has waxed and waned over the years. It’s very simple. 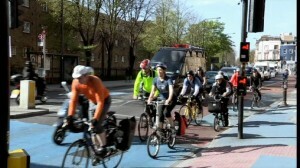 Cyclists turn up by Waterloo Bridge on the last Friday of the month at 6PM and set off at a relaxed pace around town. At one time there were multiple London rides (here’s an archived report of a West London one), but now there’s just one. It started in 1992 in San Francisco and was quickly a global phenomenon. Like most public gatherings, it is popular because a group of people agree with its aims. Critical Mass is disorganised and self organised. It is essentially a large number of cyclists trying to use their city with wheels, mostly on bikes. At different times it has been a safety protest, a desire for space or just a desire to have a good time. Almost as varied has been police involvement ranging from ignorance to assistance and usually just tailing the ride (effectively capping the size of it). Now it appears that there was undercover police involvement in at least the August 7th 1996 mass (contemporary report here). And of course, after the Olympic critical mass the police served many members with orders banning them from cycling in Newham, which didn’t impress the UN’s Special Rapporteur. “At 7PM the cyclists enter the busy evening traffic.”, and for the first time in the programme we see cyclists with a safe route through a gyratory in London. “It’s not long before the cyclists start to antagonise the motorists.” Is it? Looks to me like a taxi’s pulled out whilst a bunch of others are passing the other cyclists too closely. There’s much talk of ‘gridlock’ and a ‘standstill’, bear in mind this is London traffic after 7PM on a Friday evening. It’s not usually that brilliant anyway. Again, here are cyclists able to ride in safety around a gyratory which currently has no cycle facilities, this time outside the houses of parliament. Still, if they’re causing havoc in the traffic, I’m sure you’ll be able to keep tabs on them easily with your super duper traffic cameras and computers. Narrator: “After three hours causing havoc in the city the cyclists have dispersed” – um, I think you’re overplaying what a few hundred cyclists can actually do in London with this narration. A bit later we sit in Linda’s car as she drives 12 miles to work (every day) which takes her an hour. She gets annoyed about light phasing, I wonder what a cyclist would say? I’m still wondering because they didn’t bother to ask one. Back at TfL “Andy (a nerdier Andy than the last) is teaching the super computer how to prioritise one user over another at junctions giving buses and bicycles more green time than cars at traffic lights. At key junctions the computer is recalibrating the city in favour of buses and bikes, changing how we choose to travel.” Sounds like a lovely TfL press release, but I can’t relate that back to reality at all. Surely they would need bicycle specific signals to give bikes more green time, and there are very few of those, if any, on TfL roads. I’d love to know how this works and where TfL thinks it makes a difference. And now here are the cyclists, who for reasons of safety find themselves riding just outside the blue stripe but still in the bus lane. 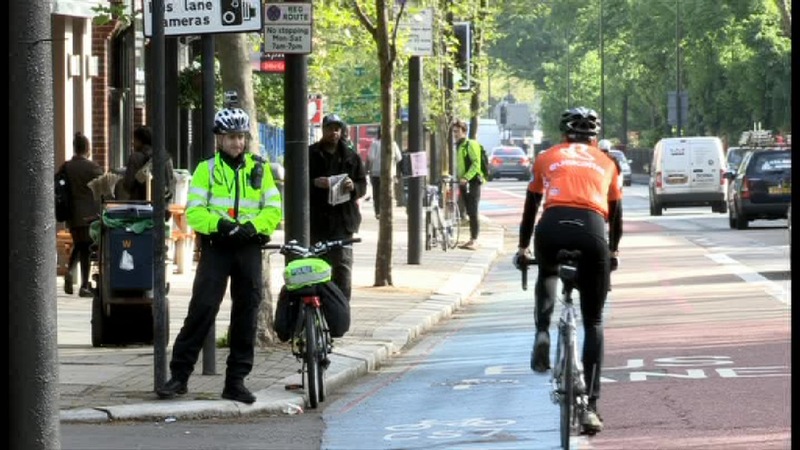 “John and Tony are from the cycle task force are watching over London’s newly prioritised cyclists.” Ah yes, they’re weaving around the bike someone’s parked at the edge of the lane. And dodging motorbikes who are also allowed to use the bus lane. PC Harrison: Cycling is what we’re trying to promote. That’s the way that things have to be.” Stirring enthusiasm there. Narrator: “But despite these new lanes, tempers still flare between drivers and cyclists.” You’d think they were just ineffectual paint, wouldn’t you? PC Harrison sends him off to PC Austen down the road, where he’s met by the van driver. Note that the van driver has now parked his van ON TOP of the Superhighway leaving space in the parking bay. Great job! Van driver: “But they don’t share, they take over roads. That’s what causes problems. Right, so how do the police deal with this situation, having spent quite some time talking to them both? PC Harrison: “I don’t know if you want to shake hands. He’s prepared to.” Hmm, didn’t exactly challenge the driver, did they? Still, I’m sure the van driver can do this without screwing it up. “The bus run over Conchita Williams, crushing one of her legs and severely damaging the other.” we are informed. 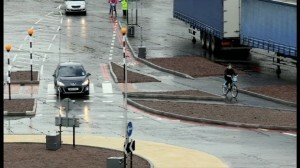 “So on a rain-drenched piece of tarmac in rural Berkshire Transport for London has come up with a radical new idea to transform the most dangerous junctions.” Um, their original radical idea was some duff shared space with cyclists and pedestrians sharing the same space and zebra crossings. This idea is from cycle activists responding to the consultation for that (at Lambeth Bridge North roundabout). “On this so-called Dutch roundabout the cyclists have priority, cars must stop for them, not the other way around.” Now, a lot to unpick here… certainly on previous solutions for cyclists off the carriageway they have had to give way (crossing a roundabout in Richmond takes a crossing phase for each carriageway on each entrance and exit for example). However, this does make it sound like cyclists get in the way and slow everything down, which is not how these work. “But will today’s guinea pigs understand this revolutionary idea from Europe?” Or are the British too stupid. Indeed, isn’t the trial there exactly to test this? I’m sure they won’t just jump on the first failure and mock it, will they? “And some cyclists still prefer to ignore the rules completely, going the wrong way around the roundabout.” Oh well. Actually, I know plenty of roundabouts where you’re somehow expected to go around it the wrong way if you’re a cyclist, like the one in Richmond I mentioned earlier. The Dutch roundabouts are smart because they usually (though not always) have everyone going in similar directions but separated at a distance. So let’s end by asking a car driver on the trial “What are cyclists like in London?” “Maniacs, they can come from anywhere. I couldn’t describe it.” It’s as if they need some… I don’t know, space for cycling? Shall we talk to a cyclist? Nah, better not. And off we go to a car accident after the least comprehensible explanation of a Dutch Roundabout ever. 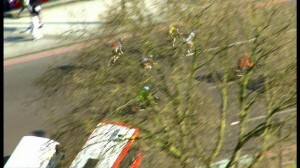 If only the BBC had access to a nice aerial camera and lots of brightly coloured cyclists. Maybe then they could make a really neat explanation… Nah, it’d never happen. So, other than channel idents, when will the BBC pump money into presenting a pleasant view of cycling? Answers on a blog comment to an address somewhere not too far from Wood Lane. Fascinating. I don’t tend to watch shows portraying cyclists as it is usually negative. TfL is institutionally motorised! This is the attitude the BBC go for these days. The are king-troll in the stir-up stakes. I’ve sent them countless emails to various programs saying that if they cover cycling they MUST show cycle training, MUST state that cyclists are allowed to ride on the road and have a right to the lane, they MUST be balanced and show that cyclists do obey the laws and actively CHALLENGE the bloody idiots who come out with myopic and generalist nonsense. The BBC are failing cyclists, just as they’re failing on NHS privatisation coverage and a number of other serious issues. I think if there was one change I would like the BBC to make in their presentation of cycling it’s to stop requiring the wearing of helmets where they are able to impose it. The critical mass demonstration segment was a rare example of seeing large numbers cycle in normal clothes on London streets. I certainly think there’s a need to see them work proactively to explain cycling as it currently functions on Britain’s roads and how it could be better. Perhaps with James Harding fresh out of The Times in news and current affairs we will see better coverage there. It is certainly true that Tom Edwards of BBC London News has made some good reports over the years, but what’s missing are the serious features. Which is a similar issue to that in the NHS, where it’s not the individual cuts and changes that make the difference but explaining the rather larger and more subtle changes that will make the NHS fundamentally different rather soon. Thanks for the write up. Saves me watching another poorly edited documentary from the BBC. Shame the BBC has allowed such a fall in standards of basic journalism. Seems to me story telling is more important than doing the basics. It’s a shame because I know a lot of keen cyclists at TfL and see a lot of pro-cycling schemes starting to come through. Not all perfect but a start. No focus on that work. Yes, the organisation is certainly not inflexible or lacking in those who are keen on making cycling better. 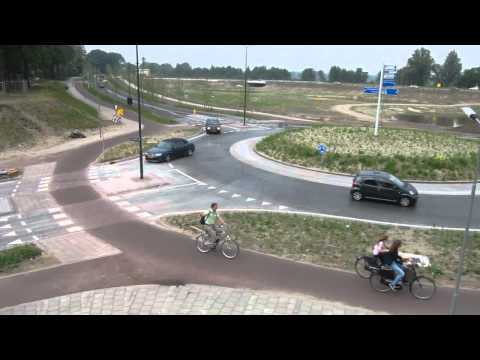 The fact there is a Dutch roundabout trial is great, and I’m sure there was plenty that they touched on in this episode that would have been better with a clearer explanation. Indeed, I could almost redub the voiceover, add in a few cyclist voices and I’d have a documentary that was pretty informative on the cyclist perspective. More and more as I follow these debates, I think it is time to implement some additional technological changes. It is time to start asking for collision avoidance systems to become mandatory on all new motor vehicles in the UK and suggesting that they should be retro fitted to all cars within the next ten years. As we all have mobile phones, it should be possible to develop systems that wont go within a certain range of a mobile phone. There by making any cyclist or pedestrian with a phone safe from motor vehicles. I think we need to also start asking for, GPS speed limiters on cars. Cycling will be most effective in densely populated urban areas. If cars are in these areas, it should not be possible for them to break the speed limit. A few years ago when Labour were trialling road pricing the car lobby described the GPS units as an invasion of our personal freedom. It’s time to show that that argument is completely bogus. As the vast majority of the population now carry a mobile phone and voluntarily make themselves trackable. Collision avoidance systems will become increasingly important as our population ages and we have more people with dementia behind the wheel. As road traffic is one of the leading causes of death in our society, there is a clear moral argument for using new technology to improve road safety. If cars were invented today, they would not be allowed out in public without these safety systems in place. Driving a car is the most dangerous thing the majority of us will do in our lifetime. It is also one of the things that makes us feel most powerful. Because of the power we feel when we are behind the wheel, there is great reluctance to implement any restrictions on drivers. For many people, that is one of the few places where they feel they have some control in life and that is why there is so much resistance to implementing restrictions on drivers. Nonetheless, the moral argument is clear and very hard to refute. Technological changes to cars is an interesting area. It appears there is a lot of research money going into driverless cars at the moment. However, it is not clear how well they would handle sharing the road in an area with a huge number of cyclists, or indeed how useful they would be compared to trains, bikes or taxis at fulfilling the same transport demand. So to decide on the idea of collision avoidance I think also involves making a decision about what we think is best for the safety of those who walk and cycle out of well driven or driverless cars. TfL are undertaking some work to look at tracking mobile phone signals as a way of intelligently designing signals to handle the proximity and number of pedestrians. Perhaps that could start to offer an indication if such technical solutions are worthwhile. Similarly there are experiments with transponders on bikes at the Transport Research Laboratory which may result in them being fitted to bikes (with sensors on HGVs). The problem with systems fitted to the majority but not all vulnerable road users is that you could create a high risk for forgetting your phone or not riding a hire bike, which may not be the risk model we want on our streets. Of course, the problem with those technological solutions to safety that use computers is that they must also compete on price against those that don’t. As such, I’m keen that we get on with implementing segregated and clear space for cycling as seen in the Netherlands and elsewhere in Europe and look at technical fixes if necessary as an added extra or a method of helping control vehicular access or behaviour where it comes into irreducible conflict with that space. Havoc, probably not. Overplaying what cyclists can do? Actually, not necessarily. People’s actions can ripple out all over the place. Take the tube. One person holding a door open might not seem to have much impact but it can delay the tube by up to a minute. And studies have shown that one minute delay doesn’t delay the tube behind it by a minute – nope. It delays it by two minutes. And so on for the next one and the next one and the next one. Now on the roads, things are different this is true, but the consequences are different. Drivers divert off on to other roads, slowing the traffic down on those. Buses get busier so loading and unloading takes longer. And then there’s idiots taking ill-advised shortcuts, or getting stuck in yellow box junctions. I do think Critical Mass wasn’t portrayed massively well – the cyclist who appeared to “defend” it would just have would some people up when a simple argument of “car drivers have the right to use the road for leisure activities – and so do cyclists!” would have been a far better statement that would have antagonised less. It probably would have antagonised others for defining Critical Mass as a leisure activity but that’s another matter. As neither a cyclist or a motorist (I do have a driving licence and I can cycle – I just don’t do either in London) I personally felt that the cyclists came out far better than you do. The reason was actually more to what was not said than said. If you challenge EVERYTHING, you sound defensive. It’s actually better sometimes to make people make themselves sound like an idiot. Like that driver at the end of the programme. To me he didn’t need challenging because he didn’t come across very well at all. Good point on the ripple of actions, trains are definitely more critical systems for this but roads suffer it as well. I would have loved to see more detail of how the extra green time compensated drivers who were delayed. Seeing the mass from the cyclist point of view possibly made it seem more of a roadblock. A few people I know in London who’ve never been inconvenienced by critical mass were immediately against it as something new and dangerous. I love the way you’ve put the statement for Critical Mass as a defence of the right to use the road for leisure activities, spot on to my ears. Ironically I think the fact that Critical Mass has become less political has made the strength of arguments used by those on the ride a bit weaker. The usual response from the community there is for more leaflets, and after the eventful July ride there’s a risk of the next being leaflet central. I agree about the strength of what was not said being of note. Indeed, the very fact that I can go through the programme and use mostly verbatim quotes plus some added commentary to reach a rather different push to my piece shows that they did capture some great material but I’d say they just didn’t explain it enough to the uninitiated. 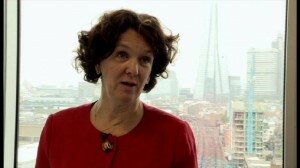 I worry – based on what I’ve seen on twitter – that the wider audience that the programme reached simply had their views of cyclists and their safety reinforced, and I think if I long for anything it is for a show on the television that could explain how cycle safety works and why such changes as are proposed and demanded in London are necessary and would make a difference. There is such a big battle still to be fought of getting people onside for change and though The Times and The Evening Standard are up to speed, somehow TV seems stuck a bit further behind. That said, it appears that Newsnight are about to do a piece on cycling from The Netherlands to London, which I’ll keep an eye out for. Well done for writing this. I was fuming as I watched the programme and you have covered all the infuriating and annoying points really well. What about TfL’s head Michelle Dix being so terrified of saying that car drivers need to be restrained in any way – by paying a higher price for driving or parking or just making it teeny weeny more difficult for them to get around? She could not say it. All she was able to bring herself to talk about was ‘nudging’ towards less car use and an indirect reference to making parking more difficult. Beggar’s belief. Have you ever had a camera crew in your face for six hours and had all the answers at your fingertips? I’m not TfL. I work at TfL. I have never covered ‘Critical Mass’ before and had no idea I was doing so until I turned up for work that day. So, until you yourself are an expert, get off your high horse. I’ve done some TV in my time, and had the joy of press attention on my own job a fair few times. I understand that you’re not TfL, this is why I refer to you both by name and explicitly as “TfL’s employee”. I think that Critical Mass section is very odd, as it didn’t actually explain either Critical Mass or what you do particularly well. It is interesting to know that you weren’t to know what was in your shift until that day, and I’m not trying to mock your skill at your job. Rather, I think that the narration on the documentary over-emphasised the effect of critical mass and I felt your own words and the way it covered your shift didn’t match the talk of ‘gridlock’ and ‘standstill’ in the narration as opposed to your own talk of ‘quite a bit of disruption’. As a cycle campaigner, I think it wouldn’t be of much benefit to anyone including TfL if only experts were commenting on roads and road safety. Indeed, we are ruled by politicians and czars who are clearly not experts but that is how democracy functions. That said, there is clearly a problem if the relationship between campaigners and members of TfL becomes antagonistic. That’s not a sensible place for things to be, we may represent interests but that’s not who we are. Well, you’ve clearly gone deep into the archives to condense that well. Literally no-one, even the people you consider your friends, will be bothered to read that. So ‘publish’ (publish I love it. You’re a publishing house? Wow I just though it was a boring blog. I didn’t realise you were the Bodley Head) this. Have you any idea how many of my work colleagues cycle to work? And that I myself cycle to the station and endure thoughtless drivers? No *sigh* Ingram, of course you didn’t. You haven’t considered the millions of taxpayers money that is going into creating cycle highways in London, the absolute care and attention that DOES go into caring about cyclist welfare. And the need to keep highways open to emergency services, tourists, and people that don’t hate cyclists but just need to get around while something like the unresearchable to the layman (there was nothing on the Internet) critical mass goes on. You are not s cycling campaigner, you are someone that wants to impress people by being a leading campaigner. It doesn’t matter whether its cycling, lack of rights for hedgehogs, or promoting mashed potato. How do I know this? Well, you do the ‘math’, son. All I’ve got to go on is what you write. And that’s enough. Wow – can you ‘publish’ this?? As well as being on telly for four minutes, I can say I’m a published author to my family. By a man that Worked at Waterstones. Your avid reader, the less ‘nerdy’ Andy. If any off you other than Ché Ingram, want to visit the department in TfL in Palestra (the building in the programme) that looks at cyclist welfare/policy for an afternoon, I will do my level best to arrange. That includes fuming Brenda. You can meet the ordinary, hard-eorking people who are trying to make London cyclist friendly. My work address is Andy.Dodds@tfl.gov.uk. I can’t promise anything, but I’ll try of you ask. (It’ll be in confidence) Alex Ingram – there is literally no point with you. I’ve now read everything you’ve written here. Campaign away.